Depart lodge at 6.00am for road journey to Sandakan. 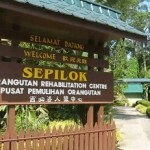 Arrive Sandakan at about 12.30pm and proceed to Sepilok Jungle Resort, which is enclosed within a tropical Virginia rainforest and in just 5 minutes walk to the Sepilok Orang Utan Rehabilitation Centre. 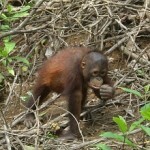 Free at own leisure or alternatively, do an optional tour to Labuk Bay Proboscis Monkey Sanctuary in the afternoon or night jungle walk at the Rehabilitation Center. Have dinner and rest. 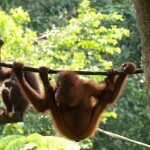 Wake up early at 8.00am and get ready for the Sepilok Orang Utan trip. 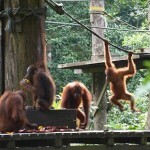 Watch one of the nature’s most endangered animal species the Orang Utan or ‘Man of the Jungle’ in local language swing from branches to branches towards the feeding station. Proceed to restaurant for lunch. After lunch, depart Sandakan for Kota Kinabalu.